Have you ever struggled to identify a fish after seeing small pictures in books? Struggle no more. 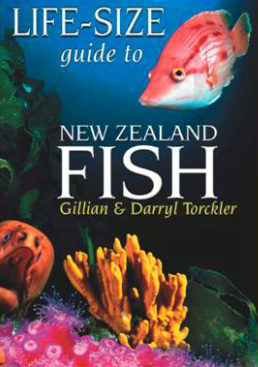 This book shows 38 of New Zealand’s common fish species in living colour, including snapper, moray eels, seahorse, red moki, pig fish, blue maomao, pink maomao, demoiselles, flounder and more. This is a partner to the Real-Size Guide to NZ Rocky Shore. The fish that live in different underwater habitats reefs, mangroves, sandy bottoms, open water are presented in full colour montage free of any text, partnered with a monotone picture overlaid with text boxes for each fish that provides tells you information about each fish’s identifying features, their lifestyle and where you might find them, and includes their scientific names. Fisherman, snorkelers, divers and anyone interested in the sea will find something of interest. I guess by now you have worked out we are keen scuba divers. We often spend evenings after a dive gabbling about fish we have seen, often reaching for a book to confirm their identification. Over the years, we have both grown frustrated by existing fish identification books for two main reasons. Firstly, the pictures are usually presented all one size (often small) with no reference to the fish’s true size; or the photographers have taken photographs of dead fish. We appreciate that for many, dead fish are the most accessible, and if you have never seen a live fish swimming underwater, it is difficult to imagine that they are individually very colourful not just that bland fish shop grey colour they all take on. In this series of books, we have tried to show people how uniquely colourful New Zealand's fish are and also show the actual true-life size of the fish to help with identification.